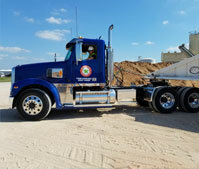 Serviceline Transport offers years of experience in shipping operations, aggregate hauling, bulk hauling and other transportation services for businesses and industries throughout Texas. We provide safe and dependable transportation services of hauling aggregates, cement and building products that deliver value to our customers. Serviceline Transport believes in performing our work with responsibility and integrity and is constantly striving to meet core values and exceed technological advances. In addition to being committed to safety, Serviceline Transport is an environmentally responsible company. Contact us to learn more about what Serviceline Transport can do for your business.